What makes the House for an Art Lover unique, aside from its Art Nouveau style, is the fact that it was roughly 90 years in the making. The concept for the design began in 1901 when Charles Rennie Mackintosh entered a competition to design a “Grand Residence for an Art Lover,” which was run by the German magazine Zeitschrift für Innen-Dekoration (Levine 2008). Mackintosh designed the building with his wife Margaret Macdonald, whom he married the previous year. However, Mackintosh was disqualified from the competition because he did not submit all the required material by the deadline. Despite being disqualified, Mackintosh still submitted the three interior perspectives missing from his original submission. As a result, the Mackintoshes received an award for their designs due to their originality and uniformity. The portfolio was then circulated around Europe, gaining praise wherever it went (houseforanartlover.co.uk 2013). 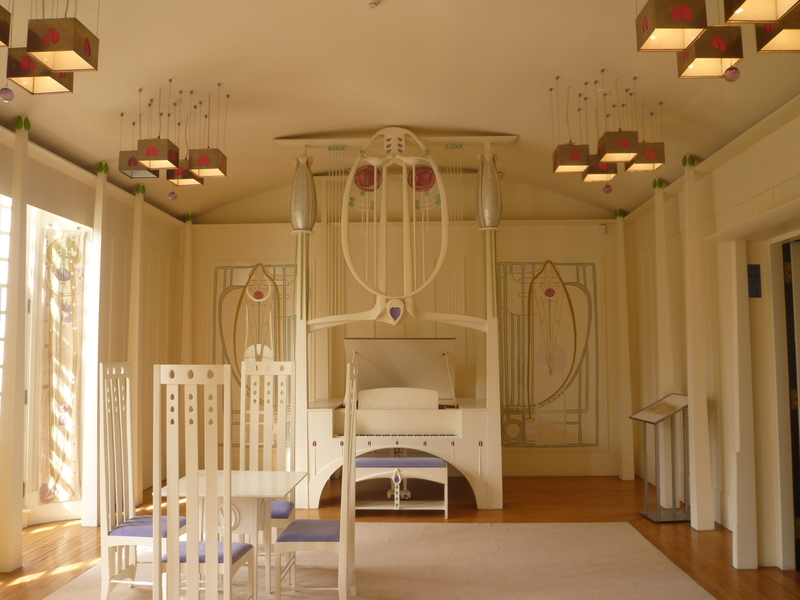 While the designs were praised for decades, it was not until 1987 that plans were made to actually construct the Mackintoshes’ “Grand Residence for an Art Lover.” The idea originated from Graham Roxburgh, a civil engineer in Glasgow who had done refurbishment work on the Mackintosh interiors in Craigie Hall. Work began in 1990 to build the House for an Art Lover in Bellahouston Park. However, in the early 1990s a recession occurred, which caused construction of the house to stop. In 1994, the work resumed so that the interior rooms and landscape could be completed. As with all of Macintosh’s works, the House must be viewed as a whole. His work incorporated multiple styles and is a compilation of opposites. Inside the house tradition Victorian designs are juxtaposed with modern concepts. One can easily see the blending of masculine and feminine, natural forms with abstract thought, or simple concepts with complex designs. 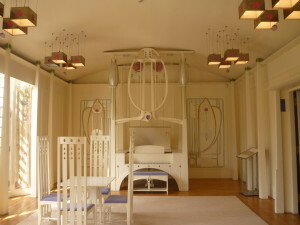 Mackintosh emphasized a need for architects and designers to be given greater freedom when expressing their ideas (CRM Society 2013); and, this ability to create an independent design is visible in the creative structure and layout of the House for an Art Lover (houseforanartlover.co.uk 2013). While the House certainly does reflect the Mackintosh style, one must remember that this is a construction based on drafts produced in 1901. It is not uncommon for architects and designers to be revising and redesigning their work until the last minute (Levine 2008). When Mackintosh worked on the Glasgow School of Art (GSA), the construction was divided into two parts. From 1897 to 1899, the funding was available to complete the central and eastern sections of the building. It was not until 1907 that there was funding to complete the western wing. During the period of waiting, Mackintosh continually revised his designs for the building. As a result, the western wing is distinctly different from those completed in 1899, having a decidedly 20th century appearance (CRM Society 2013). Given his history of altering his designs during construction, is entirely possible that Mackintosh would have made numerous changes to his draughts during the construction of the House for an Art Lover. It is for this reason that buildings constructed posthumously are often a point of contention. Many feel that there is not enough information in the designs to construct a building that reflects the architect’s intent (Building Design 2012). With this under consideration, the current House must be viewed as an interpretation of the Mackintoshes’ original designs (Levine 2008). The Mackintoshes were designing a residential house. The current House was constructed with commercial purposes in mind. 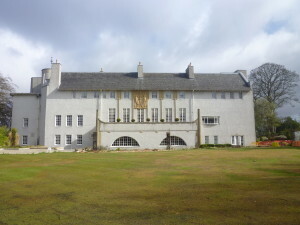 The House was built to highlight the Bellahouston Art Park, and it is currently used to house banquets, hold conference, and exhibit artwork. Inside there is a cafe and gift shop (Benitez 2005). Clearly with the change of intent came a change of structure. Mackintosh would not have been designing for the inclusion of a cafe and gallery, so the appearance would have been different. The House is still authentic in that the original designs were used, but many in the arts community want it made clear that the house itself is not an original Mackintosh (Levine 2008). Despite these differences, the House is still representative of the Mackintoshes, and the organisation running the facilities wishes to promote the Mackintoshes’ work. Today, the House for an Art Lover encourages interest in art, design, and architecture. Visual art exhibitions are held in the gallery, as well as workshops and artist talks. It is part of the mission of the House to be a centre for the visual arts, both nationally and internationally. Interestingly, it was the Glasgow City Council and the GSA that revived the project in 1994. Mackintosh had attended the GSA, and as mentioned, designed the school’s current accommodations. The GSA and House for an Art Lover maintain a strong relationship, which helps promote the House and its reputation as a cultural asset to visual arts (houseforanartlover.co.uk 2013). Benitez, T 2005, “Tradition Gets an Update.” Successful Meetings 54, 6, pp. 60-70, Business Source Premier, EBSCOhost, viewed 2 August 2013. “Kahn’s vision of freedom lives on” 2012, Building Design, 2032, p. 2, Business Source Premier, EBSCOhost, viewed 2 August 2013. Levine, Neil. 2008. Building the unbuilt: Authenticity and the archive. Journal of the Society of Architectural Historians 67, (1) 14-17.